What style and colours suit you best? 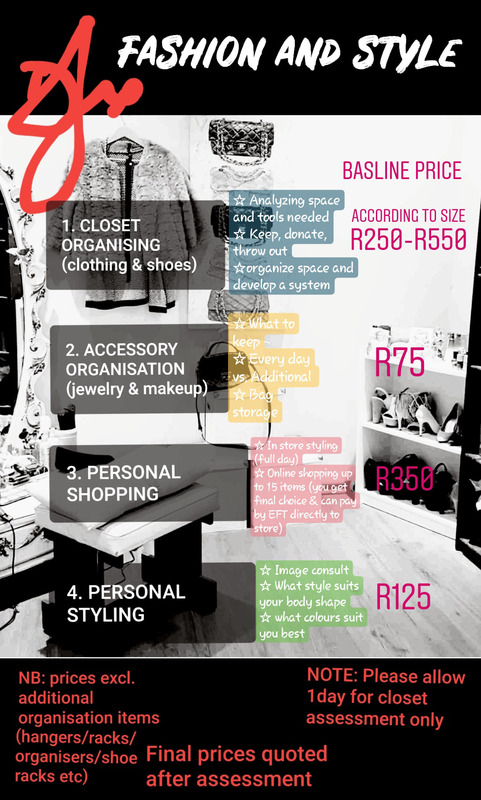 DJ Fashion and Style offers closet and accessory organisation services in Pretoria. We also do personal shopping and image consulting. Prices and details are included on the brochure below. Prices are on a baseline which additional costs to be added upon. For more information please whatsapp Danielle Manjoo: 083 679 5105 or email daniellejm07@gmail.com. Please note that additional items needed for organisation processes, such as hangers / plastic dividers / shoe racks / other storage, are not included in the prices. The price is purely the service part. Final price quoted after assessment.